Prime Minister Imran Khan has launched the first phase of the countrywide Sehat Sahulat Program (Health Card) to provide free medical and health treatment to approximately 80 million people of Pakistan. Under this scheme, about 80 million poor people will receive free medical treatment worth Rs720,000 in panel private or government hospitals. Free treatment under this program will also include procedures such as angioplasty, brain surgery and cancer etc. except transplants. These health cards will first be distributed in Islamabad then in tribal areas and then all over the country. Each family of the tribal areas will be provided with this health card. 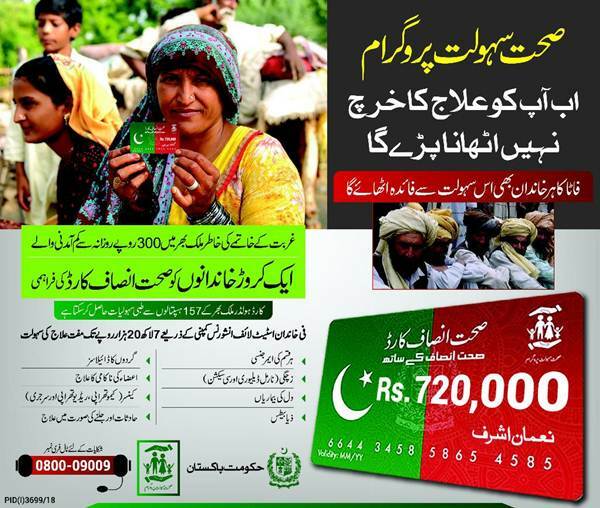 85,000 cards will be issued to poor families living in the federal capital. Who is eligible and how to apply for Sehat Card? You don’t need to apply to get this card. Initially Sehat Cards under Sehat Sahulat Program will be distributed to families whose daily income is less than Rs.300. Government has conducted a national poverty survey and anyone who falls under 32.5 rating will get this card automatically. The survey is under process. About 80 million people (15 million families) will get this facility. How to get medical treatment facility under this program? List of all government and private panel hospital will be prepared. Cardholder family will visit any of these Government or private hospital for medical treatment. The bill of the hospital will be deducted from the card automatically. The medical facilities would be available in more than 150 private and government hospitals. What is covered under this program? Under this scheme, the card holder family can get medical facilities up to Rs. 720,000 free of cost. Treatment of heart diseases, diabetes, kidney dialysis, cancer, pregnancy (normal delivery and C-section), accidents, burns and all types of emergencies will be covered under this program. Each card holder will also be provided up to Rs.1,000 as transport charges for each hospital visit. Rs. 10,000 will be given to the card holder's family, in case of an accidental death to cover the costs of the funeral. There is dedicated toll free number for Sehat Sahulat Program; 0800-09009 where people can get information or register their complaints. Click here for a list of other useful toll free numbers. 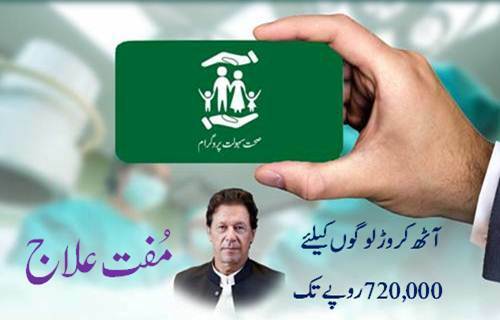 Earlier, Sehat Card was launched by PTI Government in KPK where the cardholders were able to get free treatment for up to 520,000 rupees. Now the amount has been increased up to 720,000 rupees and the program has also been launched countrywide. In 2016, Pakistan Sehat Card was also announced, in which a family could use up to 250,000 rupees for priority health care services. It is a very good initiative of government for poor people who can't get medical treatments because they don't have enough money and public sector hospitals have limited resources. Now poor patients will also get quality treatments from both private and public hospitals as their expenses will be deducted from this program. Government selects family (whose daily income is less than Rs. 300) through a poverty survey.